After waiting for over 8 weeks I have finally heard back from Fidelity about my request to transfer my CIS FSAVC into my SIPP. It wasn't good news. Because the FSAVC (Free Standing Additional Voluntary Contributions) has a Guaranteed Annuity Rate they require me to take advice before they will accept it (even though the transfer value is less than £30,000). They do, of course, offer this advice service themselves for the cost of £500. This fee is payable even if the advice turns to be "no, sorry, it's the wrong thing to do and we won't accept it". In which case, I am informed, the fee will have VAT added on top. So I have a dilemma. I knew that there was a GAR attached to my pension but I didn't think Fidelity would require me to pay for advice before transferring it, and I don't think that the FCA requires them to do so either as suggested by the quotes below from a policy report released earlier this year. "Historically there has been no need for a PTS to advise on a transfer from a scheme with a GAR and it makes sense that it shouldn't be implemented now. "Although providers should be able to show the client what benefit they are giving up if they choose to forego these GAR even if the fund is under £30,000, where advice may not be given." Should I therefore look for a platform that will take my FSAVC without requiring that I pay for advice? Does one exist? But firstly, and importantly, should I think more carefully about the GAR and what I would actually be giving up seeing as Fidelity obviously think that this option requires £500 worth of investigation by a pension transfer expert. I started paying into the FSAVC in 1996 because I knew I had gaps in my pension provision due to taking time out to have kids. I was working at the Council at the time but was in a fairly low paid role and wasn't sure how long I would stay, so I didn't really consider supplementing my pension there. Looking back this was possibly the wrong thing to do given that soon after taking up the CIS policy I got promoted into a job that's served me well ever since. Putting more into my LGPS at the time would have made a significant difference to the value of my DB pension now. It could even be argued that the CIS (Co-Op) representative who sold me the pension was guilty of a mis-selling as he knew that I was in the LGPS and could/should use that to boost my pension rather than buy an independent product. However when the new pension rules were introduced this year and it looked as if there was going to be more flexibility around taking the FSAVC before my LGPS retirement age of 66 (or so I thought until I received the letter from Fidelity), I have been glad that I went the way I did and continued to pay a (very) modest amount into the FSAVC alongside my main LGPS scheme. But what did I buy back then? Working out the actual benefit that my FSAVC "with profits" pension carries has been quite difficult, especially for someone who knew nothing at all about pensions before I started thinking about how I could retire as soon as possible a couple of years ago, . This was confirmed during a phone call with CIS (now Royal London) yesterday. So for every £1,000 in the fund at the time of retirement I am guaranteed £60 pa pension. As far as I am aware there is no index linking, widowers pension or any other "with profits" benefits. The transfer value in March 2015 was £19,200. I queried the discrepancy in the figures (projected fund around £22,000 with a GAR of 6% - surely the projected pension is £1,320 not £604?). The CIS representative responded that the figures quoted in the statement don't include the GAR and she couldn't say what the pension would actually be with the GAR because they didn't know what the end figure would be. This doesn't make any sense. The statement already quotes me a projection and we all understand that a projection isn't a guaranteed figure. Given that, how can it be right to send out statements for pensions with GARs that do not include the projection for the GAR. That's the whole point of it being a guarantee - if my fund is £22,000 at pension retirement age I'm guaranteed 6%. I'm guaranteed £1,320. The conversation went round in circles with me asking for a statement that included the GAR and her saying they couldn't do it. The only thing I could get her to agree to was to send out written confirmation that the FSAVC has a GAR of 6%, as although I have the scheme schedule, I felt that I wanted something more recent especially as the fact that I have a GAR apparently can't be included in any of the workings on my statement. The only reference to the notion that the figures may simply not apply in your case is in the "General Assumptions" section, one of which is "we have ignored any guaranteed minimum amounts that may apply to your policy". No wonder people complain that they can't understand pensions. In conclusion I now have some work to do to find out if there would actually be a benefit to keeping the pension as it is and drawing it at the scheme age of 60, when I could also draw a reduced LGPS pension. In which case I need to look at those years between 58 and 60 again and assess if there is a way my existing SIPP/other funds/extra saving could fund them. And, if I find there is no benefit to doing this, I then have to decide whether or not I want to pay Fidelity £500 to tell me the same and accept the transfer, or, even worse, pay them £500 plus VAT to tell me it's a terrible thing to do and refuse. Part 2 (including workings out) to follow, but any comments in the meantime would be much appreciated. Shocking! But hardly surprising. Fidelity are just trying to get as much money as possible out of you. The problem about shopping around for another SIPP is that it will presumably have fixed charges which you will have to pay in addition to any fixed charges for your existing SIPP. I successfully moved my teachers AVCs from Prudential to Liberty SIPP/X-O because I was shocked by the charges I was paying. There was no charges to move it but there was no GAR so it's not really the same. I would take this as an opportunity to see whether your existing SIPP is good value for money and whether a cheaper alternative would take your FSAVC without you having to pay for advice you don't need or want. You could then move everything to the new provider! If Fidelity are willing to charge you £500 for this what do the rest of their fees look like? Hi Mike. Thanks. Surprisingly Fidelity's fees are generally quite competitive (which is why I chose them :-)). I pay 0.35% for my SIPP with no dealing charges. Their set-up for flexible drawdown also looks pretty cheap although I've not yet investigated fully. I have the feeling I will end up moving away though if, say, Hargreaves Landsdown will take the transfer without advice. I believe their charges are a little dearer at 0.45% but they don't charge anything for cash (unlike Fidelity where the blanket 0.35% still applies). Hmmm...I think Ermine had a similar issue with HL with some pot he had - he thought it was just HL trying to fleece him out of money but I'm not sure he was able to find a provider who didn't have the 'advice' criteria. I'm really confused as to why there's the 'guaranteed' aspect yet they can't give you an actual figure, or is their version of 'guaranteed' not the same as ours? I have a couple of thousand in a FSAVC - have no idea if it's linked to my DB (it's with two different companies that I know of, used to be with Equitable Life...). I may see about transferring it just to have one less thing to worry about later. Good luck with getting this sorted not too expensively! It is very odd that they can't give me a proper projection on my statements but someone has since (very helpfully) suggested that it could be because it might be the kind of "with profits" pension that has a discretionary final bonus which they can't account for. Who knows. I'm going to have another look at my spreadsheets at the weekend and see how the numbers turn out if I leave it where it is which would be the simplest option. yes that is quite typical to have those final bonuses (from pensions that were started back some years ago anyway). I think my husband had 1 or 2 of those from previous jobs too. I think as long as you can get them to say you are getting the 6%, then that should be okay, no? Well having the 6% confirmed will help with the decision about what to do but it would be good to know exactly what I would be giving up if I transfer out, especially since it's going to cost me a fair whack to do so by the looks of it. What a nightmare. No wonder some folks get scared of pensions. I'm no expert in the slightest and all this talk of GARS and FSAVC has probably gone way over my head but if they can't give you a figure with GAR included where did they pluck the original £604 figure from? Nothing worse than a baseless estimation. It doesn't help anyone. I'm going through a bit of a pension mire myself by attempting to get some estimates from my DB pension on what figures I'd be looking at if I went early and what the implications on withdrawal age/benefits would be. It's a bloody nightmare! Made all the harder by everyone looking at you like you're a lunatic if you dare suggest that you may want to leave early! I feel your pain in dealing with pension sections. Mine has been quite helpful with projections but very, very slow. I found that the best way to get the information is to try to learn enough about your scheme to be able to be fairly confident you can work it out for yourself. It's not easy though. I think you may have mentioned that you work for Local Government? In that case you're also tussling with the LGPS and all it's quirks. My biggest challenge was the "85 rule" and working out when I satisfied it (not soon enough unfortunately). I have done lots of calculations on the actuarial reduction that would be applied should I want to leave early, so if it is the LGPS, and you want links to any info on how to work things out please let me know. It's the actuarial reduction that worries me. I hate the idea of essentially "giving up" something that I've worked hard for however fully admit that I don't yet know what reductions I could be looking at. I imagine the figures will be at least slightly comparable to your own scheme so I'll have a long and thorough read of your post there and see if it starts making any more sense! 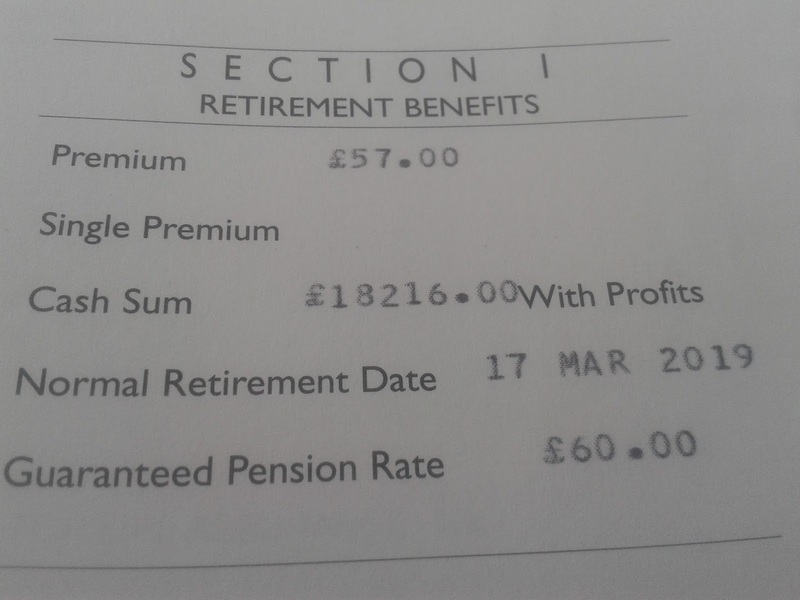 My reduction is around 4% for each year early that I take the pension early. Because I was such a "slow starter" in getting organised about things I hadn't the time to get together enough money to be able to comfortably fund the gap between my retiring and taking my DB pension at scheme retirement age of 66 so I've decided to take a hit on this. When seeking independent FA, you need to find out what it is that Fidelity want (or any other platform). It is usually a report on the worth of what you want to do, which, boiled down, is to exchange the GAR to be able to defer you main pension to normal retirement age; you are effectively investing the AVC in removing the actuarial reduction. To produce that report the IFA needs to qualify what you gain (eliminating the actuarial reduction) versus the differential between the pension you would be receiving in the interim plus the excess cost of securing the same income as the GAR. Thanks ermine, I was hoping you'd drop by. That's very helpful. I'm pretty confident that I do have a GAR of 6% so doing the calculation around whether this gives me more (in the longish term) than the actuarial reductions reduces my DB pension by should be fairly simple. However, if I did decide to leave the FSAVC where it is and draw it at 60 rather than take it in flexible drawdown between 58 and 60, I would probably try to somehow find the money to fund me for those 2 years by boosting my existing SIPP as much as possible rather than taking any more actuarial reduction. I am already planning to take a big hit on my DB pension by taking it at 60/61 rather than the scheme age of 66 so I'm really loath to slash it any further by taking it at 58. I'm going to take a good look at how much I would need for those two years, and by how much I'm short, at the weekend. I have no idea what an independent FA would charge (less than the £500 Fidelity want?) but at least you've given me some idea on which questions to ask. Thanks. I've been quoted £500 for a report from an IFA. You need to tell the IFA that your FSAVC has a GAR attached - there is an additional qualification they need to have to be able to advise in such cases. The first IFA I approached thought he couldn't help, a colleague said everything had changed so he could, but it turned out he was right the first time. So unfortunately he and I lost the time we spent, I can afford the time but I did feel sorry for him. However, it will hopefully save me money because all I want is the report - the second IFA seems to think that the plan to take a lump of cash, run it flat and defer the pension to NRA looks sensible. Sadly he now has to go tho the AVC provider and get all the data again so this will take months not weeks, that's just the nature of the beast. So £500 for advising on transferring a pension with a GAR looks to be about the going rate? In which case I may as well have Fidelity do it as although they aren't independent and can only recommend their own products, my SIPP with them is where I would want to put the funds anyway. The pack of info and forms to fill in turned up yesterday so I'm going to take a good look at the questions they are asking . I would want to make sure they understand the reasons I have for wanting to use the cash over a couple of years rather than take it as an annuity, which are much the same as yours - to prevent having to take a further actuarial reduction on my DB pension. £500 seems to be the rate for an enabling report (assuming the receiving institution will accept this as removing their liability, which appears the case for Fidelity and HL). My case is simpler and more complex at the same time - simpler because it is a bog-standard DC AVC, no annuity rate guarantees at all. More complex because it is linked with the DB pension, which I don't think FSAVCs are, that's what makes them free-standing. It appears GAR annuities often don't include spouse provision on your death and don't often include inflation indexing. If you burn this capital and surrender the annuity to defer your main DB pension, the DB pension usually includes some provision for both these features. The value of the spouse provision depends on your age difference and relative health. At 60 you are typically expected to live another 25 years; much of the value of a level annuity will be destroyed by inflation over 25 years - think back to prices in 1990 ;) However, to value this you have to take a viewpoint of inflation for the next third of your life - we are currently in a commodities bust and capital has the upper hand on labour. Most inflation seems to be a result of wage pressure. So it is a complex judgement call. I don't envy the IFA the job, it's more complicated than my case. > my SIPP with them is where I would want to put the funds anyway. Why take the restriction? I believe that there is no law saying you can't take a 25% PCLS from two or more separate pensions and the same time - after all 25% of £100,000 is exactly the same as 25% of £50,000 plus 25% of £50,000. If for some reason it makes sense to shift my AVC to somewhere other than HL I will do that. The advantage of dealing with an IFA face to face is you can ask them what things mean interactively, and indeed articulate your requirements and they can ask you what you really mean. The concept of burning up a DC pot in front of a DB pension seems to be new to everyone. Both IFAs I spoke to did a double-take as if they hadn't thought of it - pretty much all the DC pensions biz they will write is trying to make it last a lifetime, not five years. You use cash for the latter, and it's a totally new requirement post-Osborne changes. I think you're right; when I started thinking properly about the figures involved I realised that the index-linking/survivor's benefit attached to my DB pension must surely put it ahead and so that is what I should be protecting as far as possible. Thanks dearieme, I'll look into that. AJBell Youinvest accepted my NHS FSAVC, admittedly a couple of years ago, simply by me filling in a transfer request form. This was before the most recent regulations intruded. My FSAVC did not a GAR, was just DC. However I was extremely pleased to have extricated my Equitable Life/Clerical Medical fund invested in who knows what, into the AJBell SIPP so I can manage the money directly. AJBell SIPP fees are just £25 a quarter, not a percentage. Many thanks Helen. I'll certainly investigate AJ Bell, although it does look as though the GAR is going to be a sticking point wherever I go. HI - no, you didn't dream that I copied and pasted it but as, it only appeared in my mail and not on the blog, I got a bit worried that you'd had second thoughts and deleted it yourself. I decided it wasn't a good idea for me to post it back up in case that wasn't what you intended (very useful as it was though :-)). Unfortunately Blogger doesn't allow me to see your mail address so I can't contact you directly but mine is amandajc59@gmail.com. I quite often have problems posting on your site, usually when on an ipad or similar. Don't know why! I think it's possibly just the Blogger platform that hides email address - so your assumption is probably correct in most cases. It is a worry that you have trouble posting. I hope it doesn't happen so much that it puts you off altogether :-). I sometimes have trouble commenting on wordpress blogs as they need you to be signed into a wordpress account which I never am by default on my own devices (as I don't use it myself). I have also had comments disappear from Blogger blogs if I press "publish" without realising that I'm not signed into my google account. Very frustrating! I can see that you are an expert at your field!pension advice I am launching a website soon, and your information will be very useful for me.. Thanks for all your help and wishing you all the success in your business.